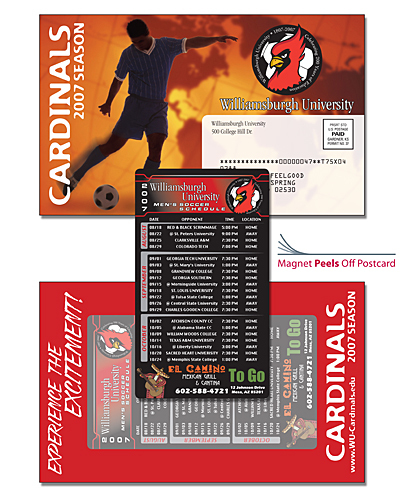 Postcard Magnet Mailers – Exciting New Product! What is a postcard magnet mailer? Simply put, it’s a standard postcard mailer with a detachable magnet attached to it. What make our postcard magnet mailers so unique and exciting? That question is not so simple and cannot be quickly answered in one sentence. Lets start from the beginning and ask why businesses even mail postcards. Successful businesses mail postcards to prospects and customers to get more new customers and increase sales. History has proven postcards generate leads and results! What can we do to make this postcard standout from my competitors? – Usually the focus will be on size. A 6×9 postcard will not blend in with competitor’s smaller postcards or the usual bills in the mail. And unlike an envelope mailer, it doesn’t need to be opened to be seen. What makes a good postcard? – Great, eye catching artwork design and a good offer (example: save 20% for new customers or first time orders). What makes our postcards unique and exciting? – Combining variable data printing (“VDP”) with an attached magnet gives potential customers a personalized touch and a constant reminder of your services. How great would it be for your magnet to be on the reader’s refrigerator when the reader develops the need for your product or service? What will this cost me? – Cost varies. A number of factors such as mailing quantity, postcard size, current postage rates, and mailing list acquirement all effect the pricing. Does Accent provide mailing lists? – Yes, we can purchase one on your behalf. Mailing list can be targeted based on factors such as zip codes, income levels, gender, family size, and hobbies to just name a few. What can I expect for a ROI (*return on investment)? – As with any marketing methods, results cannot be guaranteed. Industry studies have shown postcards to be the most cost effective method of direct mail advertisement. Couple that with VDP and the magnet, results are well above industry averages. Personalized postcards send a message that portrays a professional image of your business and gives the reader a brief, but direct personal message. Growing a business is tough; let us help you today. Contact Accent Printing with any questions or a free pricing estimate. Previously: Spring is Finally Here!